The total number of Minnesota graduates is projected to increase by 7.8 percent between 2011-2012 and 2024-2025, the next highest year. There are 62,700 high school graduates, on average, projected per year between school years 2011-2012 and 2031-2032. Non-White public high school graduates will increase in number by around 5,400 from 2012-2013 to 2031-2032, and change from 20 to 29 percent of public high school graduates. Select Minnesota's profile on the state profile dashboard. An earlier report includes Minneapolis/St. Paul metropolitan area projections through 2028. Notes: School Year refers to the K-12 calendar running fall to spring and may include graduates from any point in that school year, including the summer after the year end. The Grand Total is the sum of the Private Schools and Public Schools totals. The Private Schools Total includes schools not supported primarily by public funds, religious and nonsectarian, but not including homeschool students. 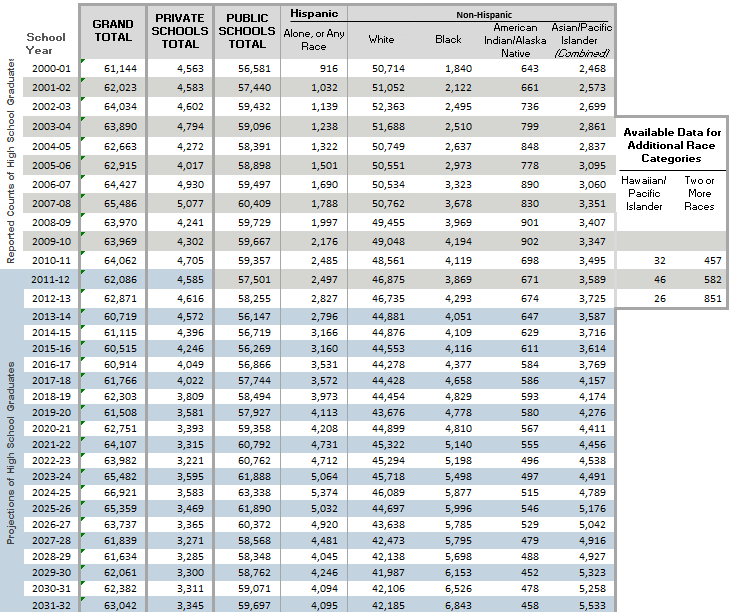 Private Schools projections begin in school year 2011-12. The Public Schools Total will not exactly equal the sum of the races/ethnicities columns, which are projected separately. Prior to 2010-11, data were not available separately for Asian and Pacific Islander students, and Two or More Races students. Hawaiian/Pacific Islander and Two or More Races counts are displayed separately in the years they were reported for informational purposes, but are included in the race categories in the projected years. For more detailed information, see Appendix C Technical Information and Methodology. Source: Western Interstate Commission for Higher Education, Knocking at the College Door: Projections of High School Graduates, 2016. For 40 years, the Western Interstate Commission for Higher Education (WICHE) has produced Knocking at the College Door, projections of high school graduates. Widely used by policymakers, enrollment managers, college counselors, K-12 educators, researchers, and the media, this 9th edition of Knocking projects by state and race/ethnicity through the class of 2032. For high school graduation projections from other states, see Knocking at the College Door: Projections of High School Graduates by state and race/ethnicity. This report was published in December 2016, by the Western Interstate Commission for Higher Education (WICHE), ACT and the College Board. Who Will Reach College Age in the Next 14 Years?